Kirsten Leenaars’ “Travelogue of a Stationary Dreamer” is a fragile and vulnerable video installation now showing at the Contemporary Art Workshop (CAW), a space that always seems about to be swallowed up, even though the CAW has been around for decades. It is the first video installation CAW has mounted in its fifty-eight-year history, and the space is well-suited to the demanding—and rewarding—act of meditation that Leenaars’ work demands. 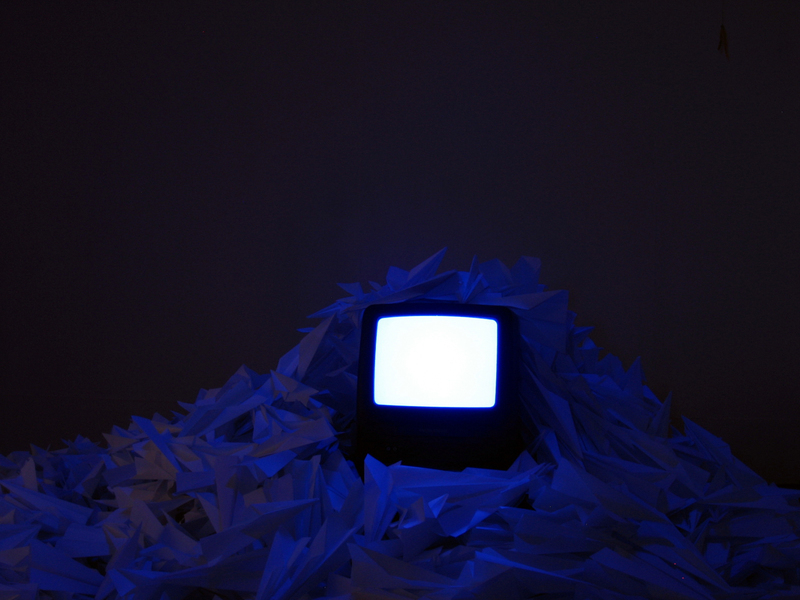 At one end of a dark room, a pile of paper airplanes is lit by the blue screen of a blank TV set. At the other end is a video projection. In the video a man sits at a table and diligently folds paper airplanes. The TV is on. We are in Samuel Beckett territory. Paper is everywhere—folded, fallen paper, suggesting messages, thoughts, emails, forming a mound like a grave. This silent mountain of paper on the side of the room opposite the video projection is a monument, the finished result, of what is going on in the video: the man’s strained, repetitive motions of folding and sending, folding and sending, his image distorted and interrupted by projected shadows and cutout animation. The TV here is the TV of childhood, the drone of listless afternoons, of the nothing that is always on: war movies, murmuring narrations. Leenaars edited down many hours of actual broadcasts and turned the images into simple black-and-white paper-collage animations in a style reminiscent of William Kentridge. The result is projected into a hollowed-out TV, whose screen has been replaced by paper, slightly wrinkled. In the video the sound of the television plays like a media feed that is also an inner voice, the captivated thoughts of a worker engaged in a menial, manual task. But when the man turns to the camera and begins to sing Eden Ahbez’s “Nature Boy,” he does so with a suavity and grace that is disturbingly enjoyable (he is played by Dale Schriemer, an opera singer based in Michigan). And then the man in the TV raises his remote, and switches you off. On the other side of town, in Jillian McDonald’s show at ThreeWalls, the little girl from “Poltergeist” says, “Hello, what do you look like?” and passes through the surface of the TV screen. A gaunt figure climbs out of a well, walks towards the screen and passes back through it again into the real world of ringing office phones, looking very evil and scary and dripping. Much of McDonald’s work involves passing from the everyday world into the world of the mediated fantasy life of movies, TV and celebrity culture. In “The Sparkling” a crystal chandelier trembles as the viewer approaches the screen. Access to the other world is held out and then denied (but we get a little interactivity as compensation). This other world of mediated fantasy life is a gigantic system of production, distribution and consumption, and McDonald has inserted herself into its supply chain in an unauthorized way. As an art of “public intervention” it is different from what she has done in the past—some years ago she was handing out candy to strangers in the New York subway, and after the September 11 attacks she was embroidering protective mantras on people’s favorite items of clothing. Later, in her “Me and Billy Bob” project, she digitally inserted herself into love scenes in the movies of Billy Bob Thornton, and crossed that same divide of the TV screen that is seen in the mash-up of “Poltergeist” and “The Ring.” When she looks back triumphantly after each screen kiss, she acknowledges this trespass onto intellectual property, and claims a little bit for everybody. The two zombie videos on display at ThreeWalls were secretly taped on public transportation by friends of McDonald’s. In “Vamp It Up” she sits among the passengers on the Forest Park Blue Line and begins to apply makeup, not stopping until her face is that of a brain-hungry corpse. The friend I was with did not appreciate it that a Williamsburg hipster would come here and presume to show us how to be zombies on the Blue Line, as if we were not already good at it. A point about class should be noted: it may be that zombie movies are always about the rising up of the oppressed and unwashed. In the New York segment, we see puzzlement, fear and even hatred registering on the faces of the riders as they take in what she is doing. They look at her furtively, processing what she is doing, maybe trying to decide what to think, and projecting on her their own fantasies about what she is. Or, maybe, just fantasizing about her delicious brain. Kirsten Leenaars, “Travelogue of a Stationary Dreamer,” shows at Contemporary Art Workshop, 542 West Grand Place, (773)472-4004, through May 13. Jillian McDonald, “Horror Stories,” shows at ThreeWalls, 119 North Peoria, (312)432-3972, through May 10. Next Post The Five-Year Plan: Breakout Artists 2004-2007: Where are they now?